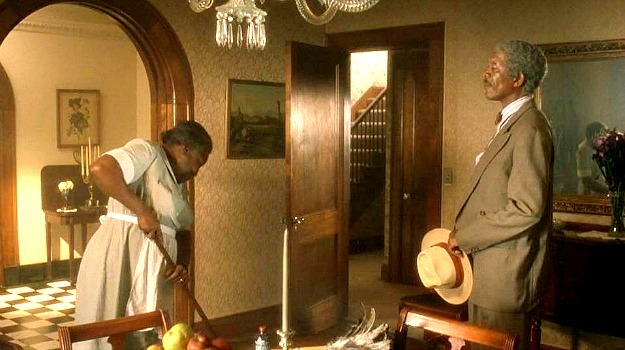 Driving Miss Daisy was a poignant movie starring Jessica Tandy and Morgan Freeman an elderly woman and her driver who became unlikely friends. It came out in 1989 and won four Oscars, including Best Picture at the 62nd Academy Awards ceremony. 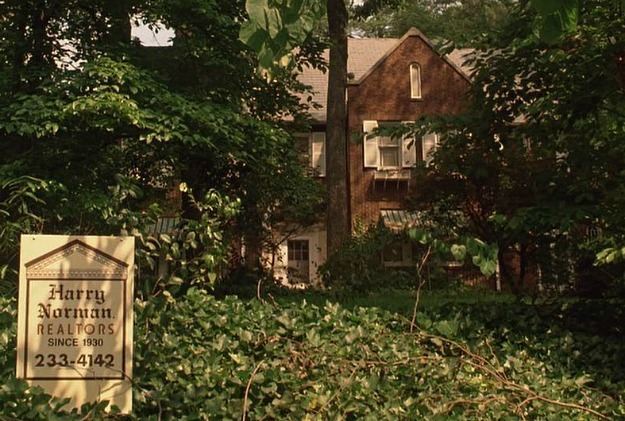 The movie had such a small budget that they couldn’t afford to create sets for it on a soundstage, so they rented this house in the Druid Hills neighborhood of Atlanta, Georgia, and filmed Driving Miss Daisy entirely on location. Miss Daisy’s house went on the market recently, so let’s see how it looks today! I miss the awnings and shutters that were on the house in the movie. The window boxes are still there, though. And look how tall that bush in the front of it got! starting in the late ’40s and going through the early ’70s. on his own grandmother and her chauffeur. It won the Pulitzer Prize for Drama in 1988. The house has 6 bedrooms and 5.5 baths. Morgan Freeman first played the role of Hoke off Broadway. He received an Oscar nomination for Best Actor. 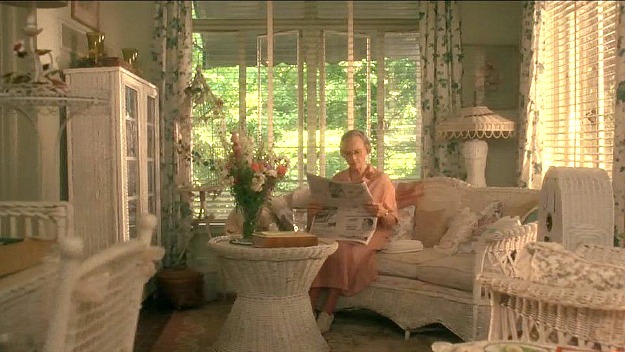 The movie won Best Picture in 1990, and Jessica Tandy nabbed the Oscar for Best Actress. She got another Oscar nom in ’91 for Fried Green Tomatoes. because the kitchens had been modernized in all of the ones they looked at. “Every kitchen, no matter how period the rest of the house was, was changed and modernized. and recreate a more vintage version for the movie. I was happy to see that the entry hall still has the same black and white checkerboard floor. Guest house with 2 bedrooms, 1 bath, and living room w/kitchen. 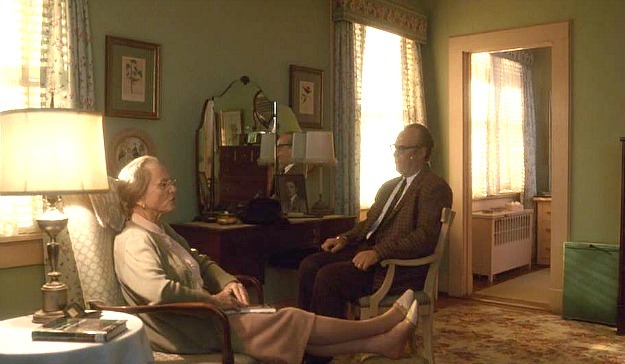 The Driving Miss Daisy house sits on a lot that has a little over one acre. 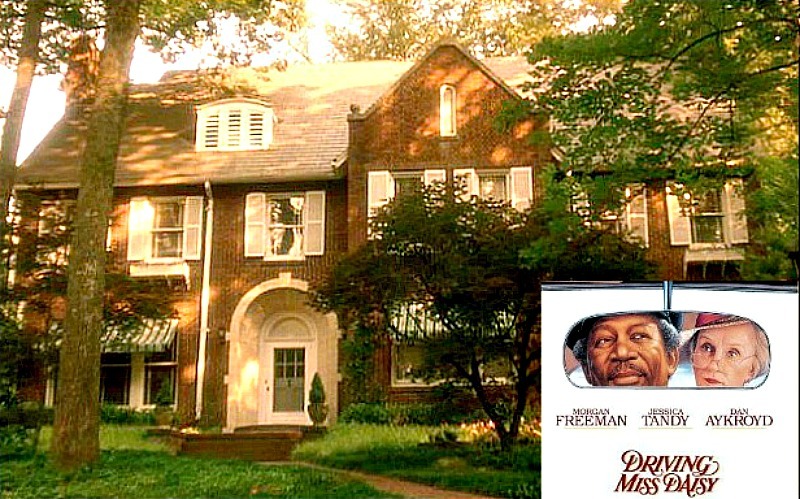 Want to live in the “Driving Miss Daisy” house? For more photos and information about 822 Lullwater in Atlanta, check the listing held by Coldwell Banker. Did you really? That’s so cool, Laney! I’d love to see it in person. wow! Amazing to see the movie scenes an how it looks today. 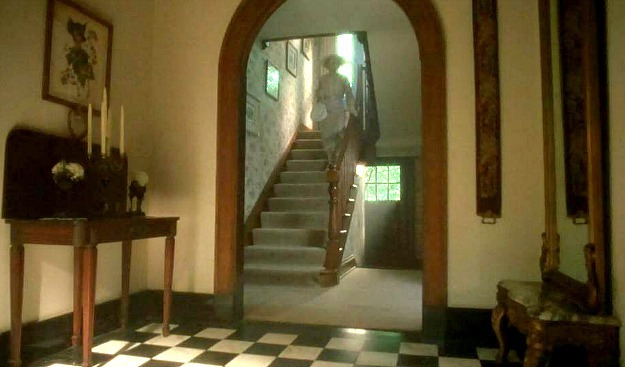 The kitchen is really quite phenomenal – they did a bang-on job with the set design for the period movie! Of course it would not go untouched and unmodernized at present day, but whoever did the real-life remodel did a tasteful job as well. Great post! A beautiful home both then and now. I loved the old kitchen though. I wonder what happened to that big old kitchen sink! I agree that the old kitchen was wonderful and I, too, wondered about the sink! I agree! For all the bells and whistles in the new kitchen, I’d prefer the old kitchen. This new kitchen doesn’t have the heart of the old one! I do like that new kitchen. It’s modernized but still classically styled, so it fits the house’s character well! Nice home, but really, almost $2 million?! I didn’t realize real estate was high in Atlanta! Love the movie, loved the house! That beautiful old kitchen inspired the black and white checkerboard floor in my little kitchen. Wonderful set decoration, just takes you back in time! Thanks for the great post! 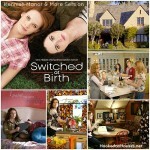 I loved this movie and fell in love with the house! I think I liked the before picts better! 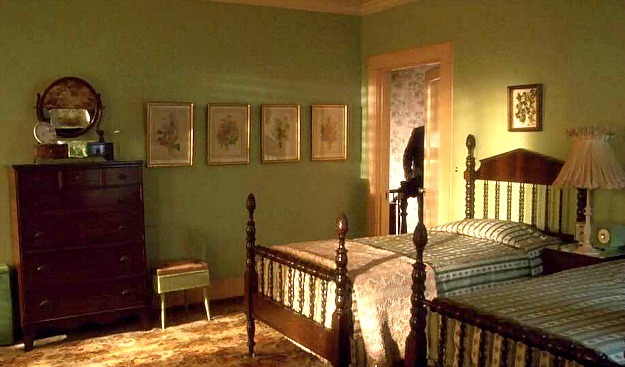 wouldn’t it be fun to be a set decorator for movie houses? I’m amazed at the way they can gut a kitchen, and manage to place it in an entirely different decade. Probably helps the actors immensely, when the sets are correct. I love these photos of the movie set with the updated house. It’s so interesting to see how the set designers created the whole look. I actually prefer the country cozy look of the film rather than the renovated home. Some parts of the house today, like the kitchen, look too generic, though its probably more practical. The film house had more character. Thank you for sharing! 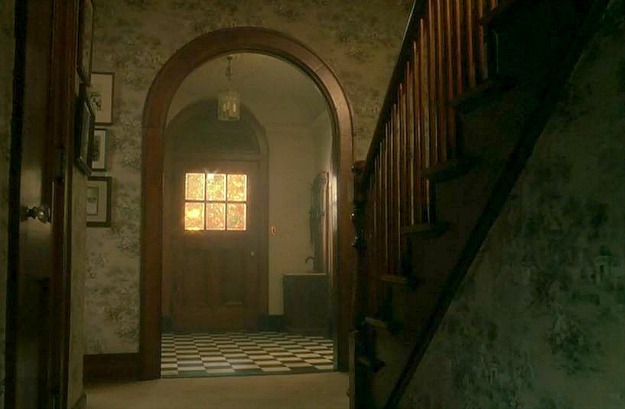 I loved the house in the movie and i have to say LOVE it now 🙂 sometimes they redo things and update houses to much i think. But this one still feels athentic to the time period. This is one of my fav movies made i have the DVD . SOOO happy they didn’t ruin the house . When I lived in Atlanta, Druid Hills was one of my “dream” neighborhoods, really lovely old homes. However, I’m surprised by the real eastate listing photos – oh my! this house could use some staging! I can’t imagine putting my house on the market at almost 2M with these photos! I agree with Susan that the Druid Hills area is a super nice section of Atlanta. 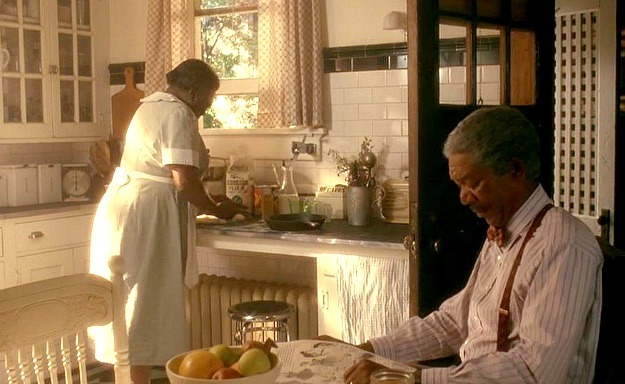 I loved all the wicker on that porch in the movie, and the old movie kitchen was charming…but I do like the range in the new kitchen. Thank you for bringing back memories of a great movie! Everything about the film moved me. The house is still lovely (could do without the red paint though). The remodeled kitchen is well done but lacks the warmth of the the film set kitchen. Perhaps I’m simply homesick for the kitchens of my grandmothers. Somehow a table and chairs invites relaxing and chatting more than an island. Maybe I’m just getting old. Thanks for showing us. 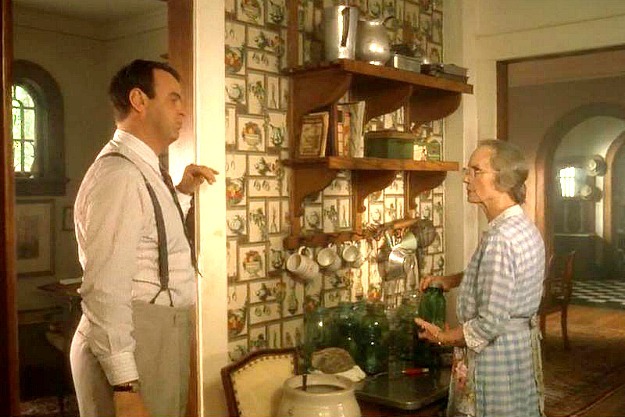 I loved the house just the way it was in the movie, and would change very little short of modernizing appliances and systems. Just love that house. I loved reading about this special house. Even though the house has changed, there is still an “essence” of the old home. Also there is still a special way the light comes into the house, isn’t there? This is a family home…with lots of space. I hope a big family buys it. It just looks like a home…and a place where children grow up and have memories. Ahhh…if walls could talk. Location, location, location — and Druid Hills is a lovely location. I hope that whoever buys it will update/maintain it just enough to keep the original beauty that remains. The movie well deserved the Oscar for best picture. I was floored when Morgan Freeman did not win the Oscar for best actor. It was unbelieveable. 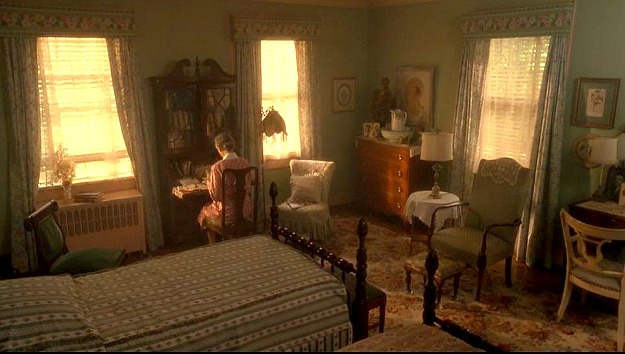 My favorite room in the movie was the lovely wicker room where Miss Daisy sits and embroiders while listening to the Russian opera. In it’s current state, I like the yellow sun room (?) with all the tall windows and that long table. Thank you, Julie. I hope many of your readers will watch this unique love story. Excuse me, I meant “JULIA”. I drive by this house almost every day (I live in North Druid Hills) and the street it is located is beautiful. I’m with you on the kitchen in the movie. I’d love to have an old-fashion retro kitchen like that one. I love the Harry Norman real estate sign in the movie pic! i used to work there and that was our office number! (Now with (404) area code first, though)! What a beautiful home. I love the way it looks now, but the white kitchen in the movie is better than the updated one. i love that glassed in porch! 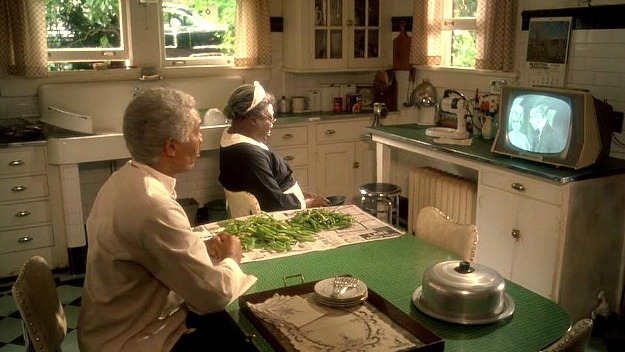 miss daisy’s kitchen looks just like my grandmother’s did. Oh I love that movie and that house!! Hopefully the next owner will appreciate it’s historical value and not rip out all the character. I am local and knew the general area where the house was but now I may have to go see it in person. It’s such a beautiful area. Have always loved that house and used to pass it daily when I was a student at Emory and lived in a guesthouse behind one of those lovely older homes. 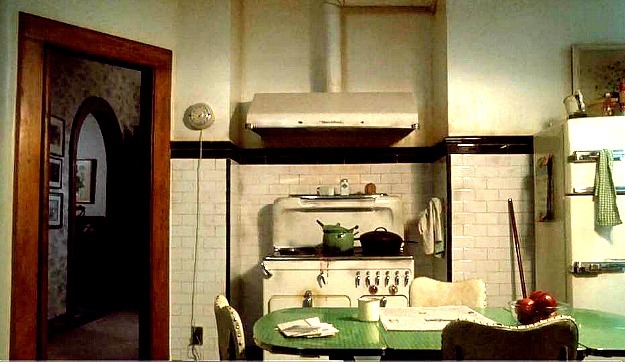 Much prefer the black, white and green vintage kitchen to the faux English monstrosity there now. The movie was not filmed entirely in Atlanta, btw. The driving scenes were filmed in my town, which looked (and still looks) like the 1940s. You did it! You did it just like I asked! I love this movie, and you’ve totally made my day. Thank you so much for not only taking my request into consideration, but for so beautifully showcasing that home I love so much. 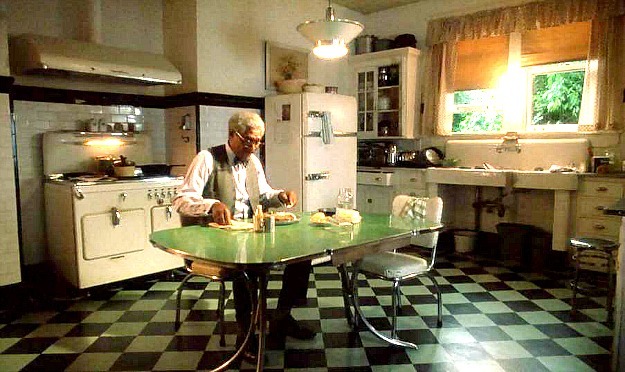 Best movie kitchen ever! The rest of the house is great, too! In real life, it’s all kind of meh, though. Love the movie. Love this house! It reminds me of my grandmother’s house in Atlanta (really old memories; she died about 50 years ago – shows my age, though I was but a child). 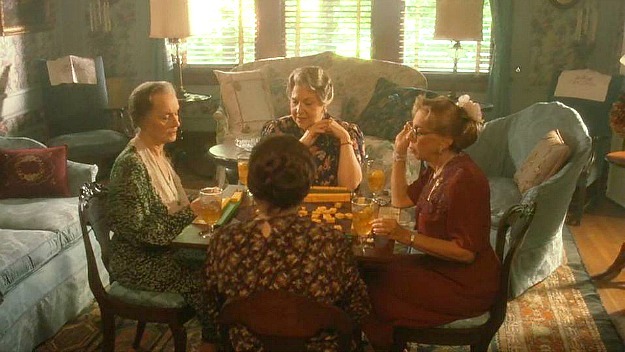 The sets are decorated in such pure southern classic style. I’ve inherited pieces like these from both my southern grandmothers. I love that the house hasn’t totally been re-done, though I would have to change some wall colors. Especially glad all the stained woodwork hasn’t been painted, which nearly always happens. And the original chandelier is still in the dining room! I love the movie kitchen – so vintage! 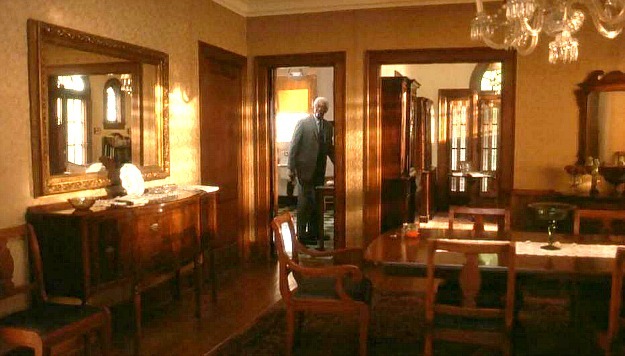 I notice, though, that the window trim in the kitchen is stained like the rest of the downstairs, but in the movie version it’s painted. Did they paint it, then strip and refinish it back to the way it was originally??? Thanks for the tour and the memories, Julia. Good question about the windows! I hadn’t noticed that. One of my high school friends from Shreveport, La, Liz McBride, was the costume designer for that movie, as well as Thelma and Louise, Shawshank,Michael,and others. She was brilliant, and died of cancer in her early 40’s. Wow, that’s sad that she died so young! She did an amazing job with the costume design on this movie. Tasteless, horrible redo. That “updated” kitchen is wrong and will cost alot to be restored properly. The enrance needs attention too. Shame. Of course I fell in love with the house all over again since the movie. I went to the listing and it has already been sold. Do you remember what the asking price was?